Voters around the state showed an appetite for more school spending, passing 6 of 11 school construction bonds and all three school local option levies. Most passed with about two-thirds of the vote. The Willamette Valley was supportive, passing bonds for Eugene and Oregon City school districts and the local option levies, which are used to supplement operating funds, for North Clackamas, Sweet Home and Tigard-Tualatin school districts. On the coast, Astoria and Warrenton-Hammond school districts succeeded, but Siuslaw SD’s bond failed. In southern Oregon, Jackson County split with Ashland SD’s passing and Eagle Point SD’s failing. 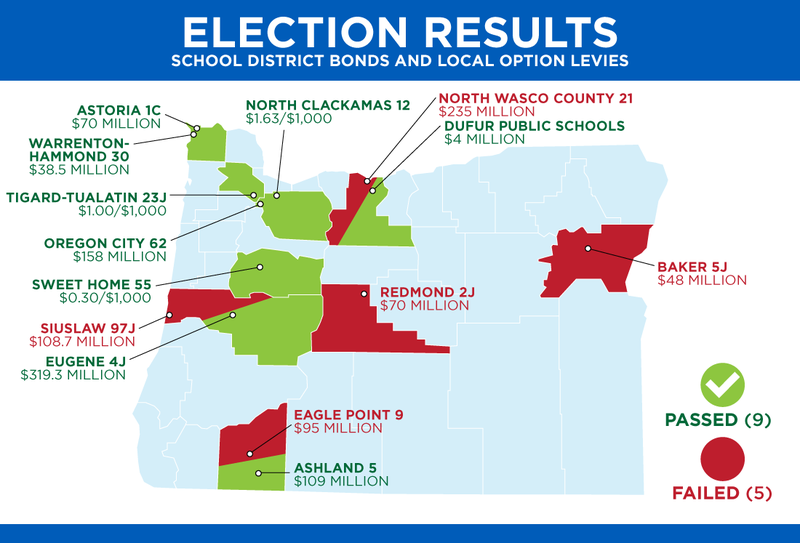 Wasco County along the Columbia River Gorge split as well, with Dufur Public Schools’ bond winning and North Wasco County SD’s bond failing. Redmond SD fell just short, with 49 percent in favor. Baker SD, which has not passed a bond since 1948, failed. See a full listing of election results.